Aircraft models with an even higher number of rotors are so far reserved for self-construction or future developments, which then complement this list accordingly. Quadrocopter There are very different designs and price ranges, so beginners and professionals can find a suitable model in the market for themselves. While most Quadrocopter are designed for an outdoor flight, there are also smaller ones Indoor models, which can be flown outdoors only in calm weather. 1 What is a quadrocopter? 2 How does a remote-controlled quadrocopter work? 15 Decide before buying if a pure indoor model is desired. Outdoors, absolute calm is required for a flight. 16 Buying on the Internet or at the local dealer? Similar to a helicopter needed Quadrocopter no wings to gain buoyancy through airflow. A flight is made possible by down-directed propellers, thereby also vertical take-off and vertical landing are possible. Compared to helicopters requires one Quadrocopter but hardly any mechanical components, for example adjustable rotor blades or swashplates. Also eliminates a tail rotor, which at a Helicopter is needed for balancing the torque transfer to the chassis. On Quadrocopter has opposite rotors to compensate for the torque. Flight, position and movements are only achieved by speed changes of the individual engines, which Quadrocopter especially for Beginners recommended although they have all the control features of a helicopter. How does a remote-controlled quadrocopter work? Before buying a quadrocopter, think about where you want to and want to let it fly. It is important to note the regulations for quadrocopters (drones). By the Global Positioning System (GPS) one can Quadrocopter, for example the Revell Control RC GPS Quadcopter, perform additional functions. For example, it will stay in place when the joystick is released. In addition, the GPS can also be used to let a model advised from the transmission range return again. Some models allow automatic follow-up of the transmitter or preset navigation points. Telemetry data such as speed, altitude, position, state of charge of the power supply are often transmitted. The radio remote control meets primarily in one Quadrocopter the same requirements as with all remote-controlled models. With it all functions can be controlled by radio. There are different control channels available. Depending on the functionality of the model, 4 to 6 channels or more are needed. The frequency ranges of the radio remote controls are 27 MHz, 35 MHz (only approved for model aircraft) 40 MHz and 2,4 GHz. Especially the newer 2,4 GHz remote controls are characterized by high reliability. If the model is equipped with a camera that sends the images via radio in real time to a receiver, make sure that the radio signals of the transmitter and the camera do not interfere with each other. For example, there are wireless cameras that use the 5,8 GHz range for transmission. There are complete sets in which the radio camera with receiver is already included. Often they even have a small display in the radio remote control, or at least allow the connection of a display. Suitable for the transmitter, a receiver is required. It processes the received control signals and passes them on to the components, for example the speed controllers of the motors. The receiver must have the appropriate number of channels for each function and use it over the same frequency range and transmitter channel of the radio remote control. In older radio remote controls, a channel change is effected by changing plug-in quartz (transmitting and receiving quartz). To regulate the speed of the electric motors speed controllers are required as with other electric models Quadrocopter according to the 4 engines four pieces. By operating the joystick on the remote control, the speed controller connected to the receiver then regulate the speed of the individual rotors or the associated electric motors. Also gyroscopes can be used to stabilize the speed controller Quadrocopter drive. Because of the efficiency will be at quadrocopters frequently Brushless motors used. They achieve very high speeds and are relatively wear-resistant compared to brush motors. Internal combustion engines are generally only used by professional model manufacturers for larger models. Compared to electric motors, they are louder, generate exhaust gases and require a gasoline mixture that is flammable and toxic. 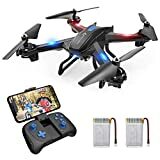 The required power for Quadrocopter deliver Accumulators (rechargeable battery), It refers to rechargeable energy storage, The big advantage is compared to batteries, they do not have to be renewed as soon as they are empty. Batteries are also preferably used in the radio remote controls to reduce costs there. However, a rechargeable battery and a charger is required, which is often already included in the sets. Depending on size, equipment and intended use, there are different types and models of the trade Quadrocopter to disposal. Choose the ideal model for yourself. We'll help you! Similar to the small one Mini helicopters there is also Mini Quadrocopter, They are particularly suitable for flight in spacious rooms, halls or even in the cold, even for outdoor use. They are very small and light. The low weight does not pose such a great challenge to the engines, which is why very small and energy-saving engines can be found. But they are very vulnerable to wind and can not be controlled anymore - or only very badly. 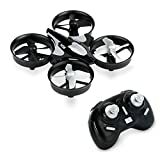 Their low price and their easy handling make Mini Quadrocopter ideal for children, beginners or beginners. Due to its low weight, damage to the model and furnishings in the event of a fall is significantly lower. In terms of price, they are in the range between 20 and 70 Euro, such as the Archer Skytech M62 Mini Quadcopter. Compact and lightweight design. With LED lights it is possible to fly at night. The 6 Axis system allows the quad to be started by hand. Stable: 6-Axis Gyro Quad-Rotorcraft Flight, strong stability, easy to implement different flight movements Stronger Wind Resistance, easier to control. 2.4 technology adopted for anti-interference. Even multiple quadcopters can fly at the same time without interfering with each other. Rechargeable high-performance battery, you can enjoy a lot of flight fun. Higher weight and stronger engines are included quadrocopters available for the flight outdoors. You have a clear one more stable attitude and can not be easily disturbed by wind, whereby strong gusts are of course also clearly perceived with these models. There is for this type of Quadrocopter also still inexpensive entry-level models, whereby the price with the size and the equipment (for example, camera system) can also quickly rise to several thousand euros for ambitious hobby pilots. Similar to other remote-controlled models, it comes also to the scope of delivery. Most Quadrocopter be in complete Sets (RTF "ready to fly") delivered with all required components. The integrated camera systems often have the choice of image quality or resolution. Some models offer one HD resolution, other deliveryn 4K quality. With the camera systems, there is still the difference whether the images are transmitted in real time, for example on a display or FPV glasses, or stored on a memory card for later evaluation of the images. By a Real-time transmission of images is a control of the model based on the received image information possible, it is practically controlled as if the pilot sat in the Quadrocopter, The name is for it FPV what kind of "First person view" stands. In connection with FPV also a GPS system is mostly used. This allows further functions. By the GPS system, which is also used in navigation systems, can the Quadrocopter orient or navigation data can be transmitted. By means of this telemetry, for example, position or current altitude can be read off. Some models can even return automatically when leaving the transmission range, which increases the security very much, especially if long distances with the Quadrocopter be covered. Another feature offered by some models thanks to the GPS system. Here the transmission signal is automatically followed. For example, if the "pilot" is on a hike from his Quadrocopter filming. Surely you will be with one Drone with camera unlikely to have much fun. Being able to look at nature from a bird's-eye view is not only a pleasure for nature lovers. Much of what is otherwise hidden can be viewed from above. With the popular FPV quadrocopter (first-person view) that is easily possible. The advantage is the easy operation, this is basically the case for models for outdoor and indoor use. Quadrocopter can also be used for commercial purposes. For example, you can use them to monitor your property, find damage to buildings and keep an eye on commercial property. For monitoring and control, high-quality models prove to be ideal helpers. Do not forget the legal situation, because data protection and flight safety are always in the foreground when using a drone. Models with camera support different output devices of the image material. Thus, a display on the remote control, a display glasses or even a connection for a display can be provided. 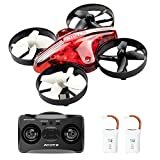 Are you still inexperienced with flying one Quadrocopter, recommends a cheaper model for the first hours of flight, especially if children want to use it. The manoeuvrable and small models for interiors promise a lot of fun for all ages. Disadvantages of Entry-level models are some missing special features, limited flight times and a lack of camera equipment, but they also provide outdoors for a great recreational fun. They are extremely easy to fly and the price is cheap. Already for about 90, - Euro you will find a very well functioning to get started Quadrocopter before. Decide before buying if a pure indoor model is desired. Outdoors, absolute calm is required for a flight. Buying on the Internet or at the local dealer? It is ideal before buying one Quadrocopters on the Internet to inform. Here you will find a large selection of products incl. Information. The decision where to buy your desired model you should always think well, because the prices here show great differences between online retailers and local retailers. We hope to help you with our information. Model-making shops are not necessarily found in your area, so a longer journey would be necessary. Of course this is associated with additional costs and time. Especially annoying, if not even parking is available nearby. For some buyers, however, this does not matter because they value expert advice - the personal consultation. Unfortunately, these consultations are not always positive for the customer, as some sellers try to sell the stock drones, which are certainly not always true test winner. Many a shop keeper is represented as a top model. Bargains are hard to find in specialist shops. Models that are offered by discounters, usually only a short time for the fun. Buy yours Quadrocopter on the internet, you can shop without restrictions. Around the clock Doors open to this shopping world, even daily. You will certainly discover cheaper prices and a huge selection of different models. Directions, stress and additional costs are saved when you buy on the Internet. Of course it is not possible to use the drone immediately, but they are Delivery times low and worth a wait. A personal consultation does not take place, but this is not fundamentally objective and customer friendly. To a Withdrawal You do not have to do without when buying online. One Quadrocopter develops its buoyancy through the propellers (rotors). Compared to airplanes, which generate the lift only at a certain flow velocity on the wings, a Quadrocopter climb and land vertically, and stand in the air. So there is no minimum speed to be respected and no runway is needed. That's why some models can even be used indoors. Also camera shots benefit from the abilities of the Quadrocopter. From a take-off weight of more than 250 grams, there is always a mandatory labeling, even on model airfields! Durable and legible as well as fireproof, must be the marking of the name and address of the user of the drone or the Quadrocopter to be inferred. From a take-off weight of more than 2 kg, in addition to the mandatory marking, a flight certificate is required, which must be repeated every 5 years. Basically, drones should not fly higher than 100 meters. For heights above, a waiver must be obtained from the Aviation Authority. It is important to stay away from no-fly zones, for example near airports, nature reserves, crowds of people or main roads. The flying over of foreign land requires the permission of the owner. For models with cameras, additional factors may be important. Just as strangers may not be arbitrarily filmed anywhere without their consent, the right to privacy naturally also applies to the use of camera drones. It is therefore necessary to know or to check the exact and regional law situation before using one Quadrocopter is flown. In addition, the regulations are constantly being expanded, which must be informed as owner and user. 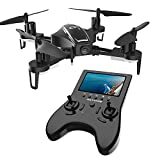 DRIVING WITH 720P HD CAMERA: Featuring the advanced 720P HD camera, the drone effortlessly captures stunning footage, incredible imagery and smooth and crisp video. FPV real-time transmission: The FPV livestream function plays back in the first person perspective, which drone with her camera is recorded on your phone. Lively and clear material and videos are there for you to discover the views you can miss. EASY TO USE: SNAPTAIN S5C Drone is a great drone with many extra features and new features. Start, land or place your order at the touch of a button. Intelligent voice control, headless mode and the mesmerizing 360 ° Flips & Rolls provide comfort for beginners.The gravity control is very funny.Note: The app currently does not support Samsung Galaxy S6. All-round protection: fly without worries thanks to the amazingly durable and flexible material. The highly elastic material, the drone can withstand the bumps. The smart low-battery alarm and the return of the one key prevent the drone from unexpectedly being lost. MAKE A LOT OF FUN: Stable height retention is a simple but very useful mechanism that ensures a stable hover in the air to maintain a certain height and make perfect aerial shots and stunning video footage without jitter.Trajectory Flight is a surprisingly new technology: just draw a trajectory on a mobile screen and the S5C drone magically moves in a certain direction. [2.0MP 720P HD Camera] With HD wide-angle camera, you can record high-resolution video and pictures. 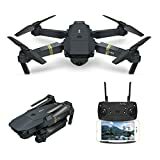 [Foldable Drone] With foldable arms, this drone is very light and easy to carry anywhere. [Hold High] The drone lets it fly stably and you can take the clearer pictures. 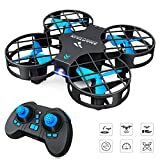 [WiFi FPV drone] This drone can connect via Wifi. With APK system you can take pictures, video, - real-time transmission through the cell phone camera picture. [With mobile / remote control] If the phone is controlled by the phone, then the remote control will not respond. 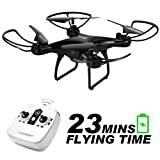 Fly Altitude: The automatic hover function allows the drone to hover at its current altitude. You can let go of the throttle stick and control the drone more easily. 3D 360 ° turn: Flip in 4 way flip (left, right, forward, backward). 2,4 GHz technology and 6 axis stabilization system for anti-interference and smooth flight. Speed ​​Mode: This mode makes it easier for beginners to control the detuning of the drone. Speed ​​setting: Low-speed mode is suitable for beginners. Speed ​​mode is suitable for experienced pilots to play in the gentle breeze. The high-speed mode is suitable for experts to experience stunts outdoors. You can adjust the speed to meet your operational needs. 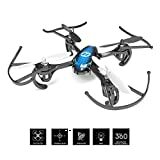 For beginners and children: This drone has the protection of the propellers, can protect the new from damage. With Return Button, the drone will automatically come back to you. 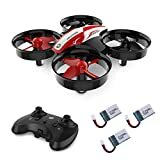 Super mini drone: This mini quadcopter has a t 3.7Vx240mAH battery with a short charge time approx. 40mins, Flight time: 6 mins. In headless mode, you can drive a drone without having to worry about which direction to show, especially when the drone is far away. Extremely long flight time: The battery allows an extremely long flight time of 10-13 minutes after a charging time of 60 minutes. Buy more batteries, search ASIN: B07D285599 on amazon.com. Stable flying system: With the latest 6-axis gyro flight control system, the mini-quadcopter flies exceptionally stable, making it easy for beginners and hobby users to use. Headless Mode: The drone is optimized for full functionality, even when out of sight. The drone is oriented in relation to the pilot. That is, when the drone is in headless mode, the forward flight direction is independent of the front of the drone. Altitude Hold function: The minidrodes will hold a certain height with this function, even if you release the throttle joystick. One-Button Start / Landing: The drone will hover automatically at the selected altitude after take-off and landing. This makes it especially for beginners who have no experience, just to control the drone and steer. 6-Axis Gyro 2.4G Hz stabilization system, the best choice for drone training. Three speed mode meet different needs from beginner to expert. Headless mode system: through the remote control simplifies control, easier control, more fun. Best Customer Service: If you have any problems or questions while flying, please get in touch with us. We will offer you best customer service. 5,8 GHZ FPV REAL TIME IMAGE TRANSFER: Due to the 5,8 GHz frequency band image transmission, the live video is transmitted smoothly and without delay, even over long distances. There are no disturbances in image transmission. You can see the video signal directly on the LCD screen of the remote control. 120 ° HD WIDE CAMERA (720P): Equipped with this compact and advanced camera, you can capture high-resolution, action-packed videos and images from a new, unusual angle. Experience your surroundings completely new! HIGH SPEED FPV ROTARY DRIVE: Powerful engines and a low dead weight ensure maximum acceleration. The maximum top speed can reach up to 45 km / h.
EXTRA BATTERY: The package includes two powerful batteries for the HS 230 race drone. So you can immediately and directly enjoy twice the flight time. In addition, a powerful battery for the remote control is included. Best customer service: If problems or questions arise during the operation, do not hesitate to contact us. We are happy to help and are always ready for the best customer service. The flight time is three times longer than that of similar drones: with 3 drone batteries in the package, this drone can run up to 21 minutes. Easy to play: The automatic hover function allows the drone to hover at the current altitude. You can let go of the throttle stick and control the drone more easily. Never lose the direction: In the headless mode, you can fly the drone without worrying about which direction to point, especially if the drone is far away. Multi-functions: The drones can perform the 3D turn and start or land with one key, making the drone easier to play. A great gift for kids and beginners: Low Battery Alarm - Do not worry about losing it. You can adjust the speed to meet your operational needs, and play the drone with your children or friends. With good workmanship, attractive looks and LED light you can fly the drone in the dark of the night.